Occasionally, as I am filling-out a form, I am asked to identify or categorize myself by ethnicity or race; given the opportunity, I usually respond other. Actually, I am a lot of things, among them one-eighth Comanche, a fact that is both significant and coincidental to my development as an artist. My mother was ashamed of her Native American blood-her father was half-Comanche, half-Irish, and 100% mean & abusive alcoholic- but I considered it a source of pride, as a kid growing-up in Wichita. As an aspiring child artist I quickly learned to recognize and became smitten with American Indian art, but in my case it was coincidental, as the Comanche do not have a great art tradition; I was fond of Four-Corners artists and their graphic, stylized and designerly approach to art and object making. As I grew older and my horizons expanded, I became aware of other indigenous, tribal or aboriginal people whose work spoke strongly to me. Indeed, I seemed drawn to the work of people who did not have the word art in their vocabulary; apparently, they were responding to a visceral, spiritual imperative: their object and mark-making was simply something they did. All of this, notwithstanding, I was taught to draw and paint in the classical model; I spent Saturday mornings, from first grade until junior high, receiving instruction at Wichita’s Center for the Arts, and from Wilma Wethington, a renowned watercolorist. Those early visual influences, however, have stayed with me to this day, and can be seen in my approach to surface treatments. I have experienced several great epiphanies in my life; foremost among them is discovering clay as my life’s work. I had dropped out of college in the mid-70s, and dropped-back-in in 1991, a sculpture major at the University of Kansas. I took Ceramics One, simply to learn about clay as a mold-making material, and within a week of my hands touching clay, I realized that I had found my medium. Another, more recent, epiphany was my discovery of the area of study known as entoptics. I came to realize just why I make the marks that I have made for years, and how I have been connected to a sense of universal iconography for most of my life. As a result, my work has become more focused, and in particular, more narrative. In turn, that narrative direction has led me toward figurative work. 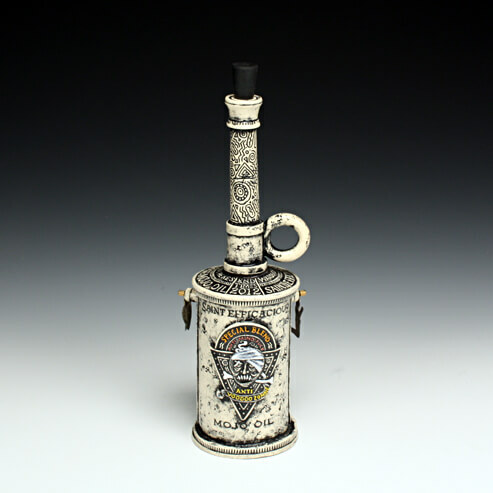 Regarding my work, I most often describe myself as a ceramist, though I utilize other materials and techniques. I enjoy the marriage of materials, such as combining fabricated or cast metallic elements with ceramic forms. Sometimes I establish a hierarchy of form through use of specific-and perhaps more precious-materials. Having emerged from a background as an illustrator, I utilize my 2D skills in my 3D work; it is critical that I reconcile surface decoration or treatment, with form. My imagery makers reference to a great many influences, cultural or otherwise. As well, I make frequent reference to the woven or patterned object; my respect and love of traditional craft media is enormous. My surfaces are tactile, inviting touch. My art is sometimes personal. Iconography and storytelling have become increasingly prevalent in my work; my personal vocabulary of imagery reflects my sense of mythology, spirituality and philosophy. I like to explore contrast: organic versus fabricated; soft versus hard; and emotional versus intellectual. I love to instill my work with humor, irreverence, animation and anthropomorphism. More than its functionality, I am enamoured of the metaphor of the vessel, particularly teapots or bottles, as they contain, serve and pour, significant activities when humans gather. Clearly, the sociology of vessels intrigues me. A number of artists have influenced me. Joe Zeller, Jon Swindell, Jon Havener, Elliott Pujol and Yoshi Ikeda are my major professorial influences. My artist-heroes are: Lara Scobie, Karen Koblitz, Andy Brayman, Scott Dooley, Akio, Don Reitz, Dan Beck, Frida Kahlo, and Sergei Isupov, among others. My advisor, on many matters, is Sandy Besser. Finally, emphatically, I believe that art making and the appreciation of art are profoundly important activities. As our society becomes increasingly inundated with technology, I believe that the beautiful handmade object will gain in value-intrinsic and economic-and importance. As life becomes more complex, art will continue to serve as an essential, visceral and therapeutic connection to the wonder of our humanity.